The popular Indian festival of Navaratri (or Navarathri/Navratri) is about to begin and I am listing out some of the traditions and significances along with useful and interesting recipes, in a new series on my Blog, on “Navaratri: Fasting and Feasting And Everything In-between”. The first part of the series is on Navaratri Golu and How To Keep It. 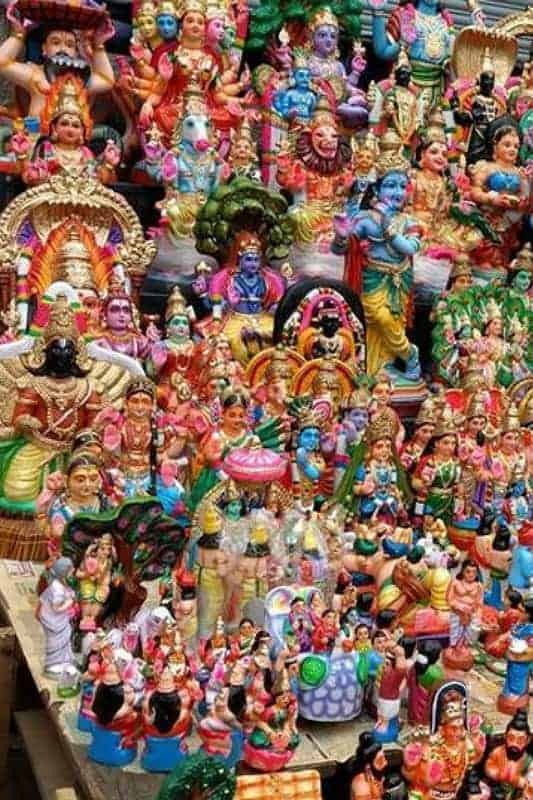 I hope it will be useful to those keeping golu for the first time, or having practiced Bomma Kolu (or Golu) for Navarathri for a few years are interested in knowing more about the significance and how to arrange the dolls as per traditional customs. When Should Navaratri Kolu (Golu) Be Kept in 2018? This year, Mahalaya Amavasai from 11.32 am on 8th October 2018 to 9th Oct 9.16 am (this is for Chennai). Here is a quick timetable applicable to Chennai. You will need to check the Panchangam for your city/country to ascertain the date and time for Mahalaya Amavasya, and extrapolate the time table accordingly. Let me add here that all the information on this post on Navaratri Golu and How To Keep It is either from traditions followed in my family, or else gleaned from reading a number of texts related to Hindu festival traditions. I do not claim to be an expert but have tried to locate sources as authentic as possible. I will now dive straight into the procedures to be followed and explain the background as I go along. At least 3-4 days before Navaratri is to commence, sow the seeds/ grains/ legumes for mulaipari. First wash the seeds/grains and soak in enough water to adequately cover them, soaking them overnight. Take a clean tray or plate (try to keep one dedicated for this purpose, or at least a plate that has not been used for eating food. Spread clean sand or soil on it. 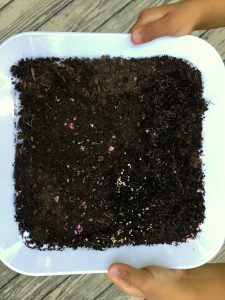 Scatter the grains for sprouting in circles one within the other and cover lightly with a layer of sand or soil. Sprinkle water daily at least once a day, and twice if the soil is growing dry. For the next 3 days, place the tray in the sun for half a day and then in a dark shady spot (indoors) for the rest of the day. Soon you should be able to find the green grassy sprouts all around the tray. I have simply planted today, methi (vendiyam) seeds, mustard seeds and sesame seeds which will (hopefully!) sprout quickly, and keep them in front of the golu to symbolise the mulaipari and to supplicate the Goddess for prosperity and growth. Some of the texts I referred to mentioned several other grains/ seeds including barley, kadugu (mustard seeds, rai), vendiyam (mendiyam, methi, fenugreek), cholam (jowar, sorghum), ellu (sesame seeds), red millet (kambu, bajra or pearl millet), kollu (horse gram). One reasonable explanation I found for why the navadhanyam differed across Hindu texts were because of differences in crops cultivated in various regions. There seems to have been even a method for the order of arranging the grains. If you have more information on the order of arranging the grains/legumes please add a comment and I will update the post,in the interest of keeping it as authentic as possible. So far as I know, the ragi (finger millet) is on the outermost circle,followed within by the dry broad beans (mochai) and the blackeyed beans, and then the urad dal and the other grains/legumes. Background: Mulaipari refers to the Nine grains (navadhyanyam) germinated in a dedicated pot or vessel. Traditionally in rural Tamilnadu, the grains were grown in mud pots each placed in the village temple and carried on their head by the village women in a procession on the last day of Navaratri, with the mud and grains dissolved in the river water. The custom, as I understand it, is to supplicate the Goddess for rain and fertility for the land as well as for prosperity for all. There are some interesting tales of the sowing of grains and legumes relating to the Pandavas and Krishna, but I’m not going into that now as this article is all about Navaratri Golu and How To Keep It! The Golu symbolises that Divinity will be a presence in the house during Navarathri, so clean the house and the Pooja vessels and idols, pictures, before Navarathri commences. The Bomma Kollu steps are to be set up on Mahalaya Ammavasa, that is on the New Moon Day in the Tamil month of Purattasi (Ashwin in the North Indian calendar). The moon will be in ascendancy (waxing mode) from this time till Pournami. Goddess Durga is believed to have descended to Earth on this day in response to prayers from devotees. Nine steps are kept for the Golu or otherwise 3, 5, 7, 9 steps are arranged, i.e. in odd numbers only, and more than one and usually not exceeding 9. The popular version of the significance of the 9 steps is that they represent the 9 Navagrahas. Traditionally, the top most step will be smaller in length than the one below it, and so on till the bottom step which is the longest. The steps would all be of the same width, though. When you are living away from India, it may not be possible to have uniform steps set up (in India you can buy ready made steps or racks suitable for the Bomma kolu) and you would probably make do with tables and cabinets of different sizes and lengths. It is usual to place the Steps against a wall (a corner would be great to give support from two sides) so that the dolls face East or otherwise North. Generally the golu is not kept facing South. The Navaratri Kalasam is placed late in the evening on Mahalaya Ammavasa after the steps are installed, while the Dolls are placed the next morning. This custom varies in different households. In some, a pair of marapachhi bommai (traditional wooden dolls) are placed first on the stands instead of placing the kalasam first. Some follow the custom of placing the dolls on the same night, i.e. once the stand is set up. Pooja with naivedhyam starts from the morning once the dolls are arranged. Again there are different customs on how to keep the Navaratri Kalash or kumbha. One is to fill an oval brass pot (a sombu) upto the neck with rice and lentils (thovaram paruppu). Add some coins to the rice, place a stick of turmeric on it. Place mango leaves at the mouth, tucking the ends into the rice, and insert a coconut marked with turmeric and kumkum on top. The coconut is kept intact during the nine days of the festival. A silk cloth or blouse piece may be tied around the kalasam. In some traditions, the pot is filled with water (instead of rice), to which is added pieces of turmeric as well as items such as cardamom, clove, vetiver root or sandalwood. Coins are added to the pot. A piece of camphor would help keep the water fresh for the 9 day period. Mango leaves as well as the coconut are placed in the mouth as usual. The pot is kept on a brass plate of rice rubbed with turmeric powder and kumkum powder. The kalasam may be decorated with jewellery. Background: The Kalasam is a traditional part of Hindu festivals and rituals and is considered auspicious. It is intended to represent the Mother Goddess. The water in the pot is said to symbolise the source of life and to be energised from the shlokas and Vedic mantras uttered during the Pooja.The Coconut from the coconut tree of which every part can be utilised, symbolises the qualities of giving and unselfishness. The Mango leaves, again found in every festival, is said to be placed for medicinal purposes: the tips reaching into the water in the pot are considered to transfer some of their antioxidant properties, while the surfaces of the leaves absorb carbon dioxide from the atmosphere. The Nine steps for Navarathri Kolu are said to represent the evolution of beings from the ‘lower’ animal lives to divine. One version is that these are the 9 steps to attain moksha (as usual there are many interpretations). If you are keeping 3 or 5 or 7 steps, reduce the number for each type below, but follow the descending order. Dolls and toys depicting any theme may be placed on the side of the golu stand or even on one of the steps. If you don’t have enough golu dolls, don’t worry but get started with whatever is available including your kids’ toys, and keep adding new dolls each year, as is customary. Step 1: Topmost step: Kalasam in the centre, often with a mirror behind it to reflect it. The idols of Gods: Ganesha, Vishnu, Siva, Brahma, Parvati, Durga, Mahishasuramardhini, Saraswati, Mahalakshmi, Hanuman, Murugan etc arranged in front of the kalasam and on either side. Some customs require the kalasam to be placed in front of the Golu stand and not on it, but usually it is placed, as above, in the centre of the topmost step. Step 2: Ashtalakshmi with the various forms of Mahalakshmi. In this, the suggested order is Adhi lakshmi, Dhanya Lakshmi, Dhairya lakshmi, Gaja lakshmi, Santhana lakshmi, Vijaya lakshmi, Vidhya lakhmi and Dhaya lakshmi. The Marapaacchi bommai are also kept on this step, though some customs place it on the topmost shelf with the kalasam. These are a pair of dolls, a male and a female figure, carved out of a medicinal wood. In olden times these two dolls are said to represent the King and the Queen, and traditionally a pair (usually a heirloom) is given to a bride at her wedding and are handed down to the next generation. Step 4: Alvars, Nayanmars, Saints and Gurus such as Sankarachariyar, Ramakrishna Paramahansa, Swami Vivekananda, Meera Bai. Navagrahas are also usually kept in this step. Step 5: For venerable persons such as Mahatma Gandhi, Netaji and other freedom fighters, Thyagarajar, Thiruvalluvar and other poets, musicians, philosophers and composers including famous persons from around the world. Step 6: Dolls showing human activity and work, symbolising day to day functioning: Musicians, artisans, farmers, temples and devotees, villagers, bands, soldiers, wedding processions, sportspersons, etc. The Chettiar couple are placed in the centre with rice, salt, lentils, fruits in front as their ‘shop’, depicting intelligent humans and paying homage to traders. After the kalasam has been kept and dolls arranged, it is time for the kolam or rangoli. This is to be drawn in front of the kolu stand. The kolam is drawn with rice flour and it may be a simple one or it could be as intricate as you want to make it or filled with colours. The kolam is usually cleaned and drawn afresh every day. The kalasam and mango leaves are not changed during the nine days. Next, set two lamps, one on either side of the kolam, kuthu villakku if available. Every day, naivedyam is to be offered to the Gods after lighting the lamps. Traditionally, this is done twice a day. The naivedyam for the morning may be fruits or Payasam or even a rice dish which can then conveniently serve as lunch or for the school tiffin box. Sundal and a sweet are usually the prasadam in the evening. Fruits may be offered instead of a cooked prasadam. Often a different type of sundal is made on each of the nine days. As you would know, in South India, the 9 day festival of Navarathri is to celebrate the 9 forms of the Mother Goddess. The first 3 days are dedicated to the worship of Durga, the next 3 days to the worship of Lakshmi and the last 3 days to the worship of Saraswathi. This culminates with Saraswathi Pooja on Navami and with Vijaya Dasami being celebrated on the 10th or Dasami day. Some friends asked how to remove the Navaratri Golu, whether there are any ‘rules’ for this. Well there are some customs for this too! Traditionally, on the evening of Vijayadasami or Dusshera, i.e. the 10th day after Navaratri, we offer naivedyam (it can be simple fruits too, if you are not able to prepare cooked naivedyam). Once this is done, symbolically the kalasm is shifted towards the North side/end of the step now which it is kept. One doll at least is put lying down as if it is put to sleep. The golu may then be said to be closed and may be removed or dismantled the next day. If you have kept rice and dhal in the kalasam or the plate on which it is kept, the same may be used for making food such as a ven-pongal. The coconut may be also used in cooking, if it is fresh. If there is water in the kalasam, it may be poured out in a nearby garden or even a roadside tree. Generally, golu is not removed on a Friday or a Tuesday. if the day after Dasamai falls on a Friday or Tuesday, then the golu is removed on the evening of Dasami itself. Some people believe it best to put at least one doll to sleep (lay it down flat) after the morning naivedyam on Dasami, and then dismantle the golu in the evening. I have not found more information on this, but will continue to research and add more details soon. This article is just on Navaratri Golu and How To Keep It. The festival is celebrated in different ways in other parts of India and I will describe them in further posts. That’s an useful post. As some others mentioned, I do not even have steps to create Goku. But I still want to do from this year onwards with a few dolls I have. Is it Okey to do so on one to two levels? Thank you Preetha. Golu is traditionally kept on odd numbers of steps. One step may not look like a Golu. See if you make 3 steps – use books, cardboard cartons, bricks, tables – anything available. Cover it up nicely with cloth or a saree. Start with whatever dolls/ toys you have. Golu dolls get collected over years – it doesn’t matter if you have only a few on each step. All the best, and send us pictures of your first Golu! Very informative. Thank you so much for sharing, this is helping all of us beginners. Thank you Nalini! Glad it is of use! I am from north india and i just love south indian culture and traditions and the way they celebrate navratri. After reading the post even i want to keep a golu at my house though we keep kalash every year during navratri. Here we dont get golu dolls. Can i use my gods idol that i have at home. Hi. Yes you can. And you can get wooden or clay dolls locally available: Rajasthani musicians set, Women working, farmers in the fields etc. And musical instruments, kitchen utensils (all small like toys, made of clay or wood). Radha Krishna sets etc. Swami Vivekananda, Gandhiji etc. Amazon offers quite a few from South India , I have got them for my daughter – search for ‘Navaratri dolls’ and ‘Dancing Dolls’. A Golu collection is usually built up slowly over the years. Hello thanks for all the info I want to start keeping golu this year onwards. Can I do it I don’t know I am working and there is nobody else at home to help me. My son is just 6 years old and hubby is into business so quite busy. Pls tell me if i ca start with a few dolls and just 3 steps? Hi Ranjini! Of course you can start small, with whatever dolls are on hand, even toys! You can keep milk and fruits for Naivedyam when you don’t have time to prepare a Sundal or a sweet! All the best, and do post a picture of your first Golu! That’s a great explanation to the golu tradition. I do have doubts. Please clarify. I wish to perform the golu ritual starting this year. Main concern is on the event of periods…and also whether there could be days without guests. As I have a profession to attend. Hi Srividya. Thanks for going through my post on Navarathri Golu. Let me try answering your questions with my own opinion. What is required is to offer neivedhyam every day that you keep the Golu. Those days that you are not able to, ask anyone in the family including your husband or a son or daughter, or even a friend or neighbour to offer fruits and milk as neivedyam instead of your doing it. And you don’t need to have guests every day. You could call your friends and relatives to visit your Golu on specific days, that way at least you reduce the risk of any one dropping in unexpectedly. Keep a thambolam of a jacket piece, manjal, kumkumam, betel levels and bananas on hand in case some one does come in on any of the days. Hope I have cleared your doubts and feel free to ask if there is anything else. Hi Renukadevi. I have not given timings for the daily Pooja as these don’t seem to be prescribed anywhere. The Pooja may therefore be at any time that is not ravagalam or yammagandam. In the morning, at your earliest convenience have a bath and make Naivedyam and do the Pooja. In the evening, with Naivedyam, before sandyakalam when it begins to turn dark. Hope this helps. Well written, very informative. Thank you. Thank you for reading this post, Dharini! Great post Sujata well written and a must read.Our celebrations are really different. I’m glad you like it! Any inputs on additions/ corrections or a custom in your family are welcome!